"At first glance, Albion Street in the early 1930's looks much the same as it does now. On further inspection, the differences become apparent. Both Albion Street and Foster Street were two-way streets, now both one-way. The Wakefield Daily Item building, built in 1912, had its entrance at the corner of Albion and Foster Streets. In 1933 and 1934, the company purchased the two parcels of property west of the original building, site of the Atherton grocery store and later the Champagne furniture store. The properties were razed and the addition to the building was completed in 1935. The Hibernian Building was purchased by Division 26 of the Ancient Order of Hibernians in September, 1924, the upper levels used as the meeting hall and headquarters, and the ground floor rented to stores. 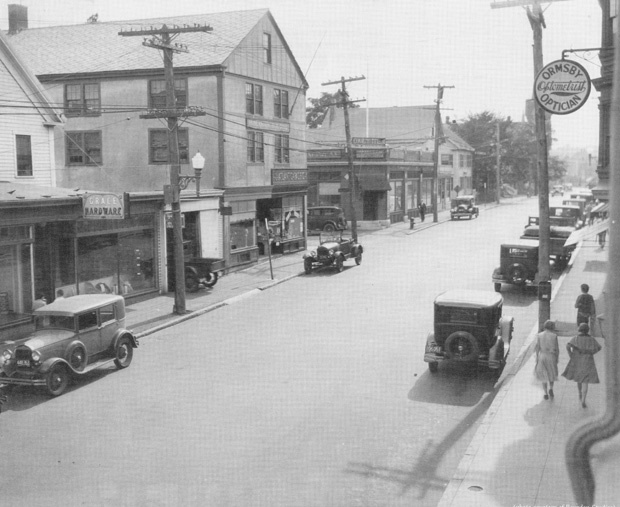 In 1931, the stores included The Great Atlantic & Pacific Tea Company and what may have been the Bellevue Shoppe which was located there in 1925. Next to Grace Hardware, what is now a store was once a garage." -- Text from calendar by Jayne M. D'Onofrio. Photo courtesy of Bourdon Studios. “Albion Street, circa 1931,” NOBLE Digital Heritage, accessed April 22, 2019, https://digitalheritage.noblenet.org/noble/items/show/6862.